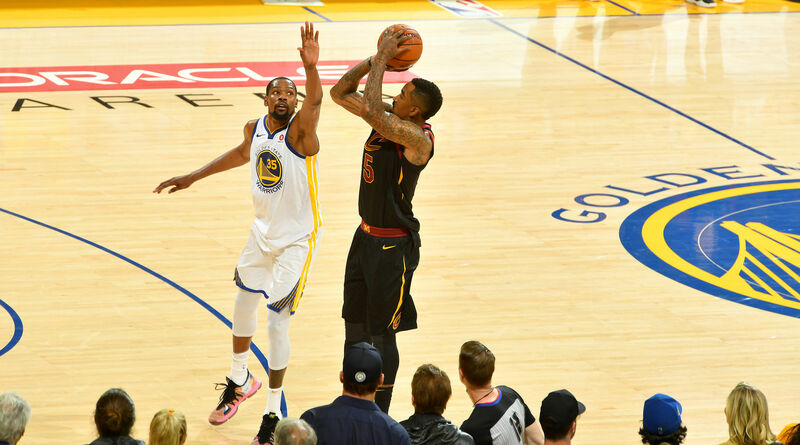 Game 2 of the NBA Finals will either feature a compelling comeback from J.R. Smith and the Cavaliers or a dominant peformance from Kevin Durant and the Warriors. The NBA Finals continue Sunday night in Oakland, and after a thrilling Game 1 that ended with officiating controversies and J.R. Smith mysteries, it's time for Game 2. It'll be difficult for the encore to live up to the madness we got Thursday night, but here are three questions to track as the game unfolds. 1. How will J.R. Smith and the other Cavs respond? The Cavs just lived through a nightmare. They responded to every Warriors run, the defense held up reasonably well, they got an all-time great LeBron James performance, and... it all fell apart in the cruelest way possible. At this point, there are many reasons to trust LeBron to respond, but the supporting cast is trickier. J.R. Smith will be the first Cavs role player to watch -- for obvious, was-recently-internationally-trending reasons -- but the question applies to the entire team. And Saturday afternoon, LeBron echoed those sentiments. "It's one of the toughest losses I've had in my career as well," he said. "Because of everything that went on with the game and the way we played. Obviously, we all know what happened. So it was a tough 24 hours not only for G-Hill and for myself, but for our whole ballclub. We put ourselves in a great position to be successful. But like I said, you give yourself a day -- if you need to take two days, OK. But today you should feel excited about the opportunity to be better and be great, and move forward." There was also Smith speaking Saturday, and he addressed the nightmare in the final seconds. "I’m glad it happened to me as opposed to anybody else on my team," he said. "It’s not a situation that everybody can handle.” That logic checks out. Baffling/blissful detachment from reality is a core feature of who J.R. Smith has always been. Sometimes it hurts his team and drives half a billion people insane, but there other times when his immunity to pressure has made him invaluable. In any case, that quality -- "J.R. being J.R." -- probably gives him a better shot at staying productive than almost any other player would have in a similar situation. But beyond J.R., and beyond the agony of that final minute for the Cavs, the biggest problem is that stealing Game 1 was probably Cleveland's best shot at stealing this series. Players have to know that, too, or at least wonder about it. We'll see how they respond Sunday night. 2. What's Going on with Kevin Durant? This deserves a longer conversation at some point, but Kevin Durant has been out of rhythm for many of these Warriors wins. He's still effective at various points, and the Warriors are generally dominant regardless, but it's been strange. Durant is doing most of his work in isolation, and the difference between KD and the rest of the Warriors offense has never been easier to spot. Matt Moore of The Action Network did a nice job distilling this phenomenon on Saturday, including this note: "In the entirety of last year’s playoffs, Durant had 37 isolation possessions, via Synergy Sports. [In these playoffs] he has… wait for it… 128." In Game 1, he scored 26 points, but it came on 8-22 FG, including more iso-ball that generally led to long-pull-ups. For his part, Durant admitted he took some bad shots in Game 1, but he’s not worried. When asked about striking the balance between playing within the offense and taking over on his own, he said, "I think it's definitely gotten better since last season. That's on me to know the flow of the game. I think I've done a solid job of that throughout this season and throughout the playoffs. I had some games where I struggled a bit, and that's just a part of it. But just kind of feeling the game, how each game might be different, and I think that goes into focus. So if I come into the game knowing and being prepared for anything, then I can conquer it." The past few weeks may not mean anything. And even if on-court chemistry issues with Durant are real, it may not make a difference against Cleveland given Golden State's advantages everywhere else. But watching this story -- how Golden State uses KD, how it's changed, and what it means -- has been one of the better subplots of the past month. And after a shaky Game 1 from Durant on both ends of the court, it'll be interesting to see where things go next. 3. Can Golden State end this series Sunday? It possible the Cavs can win Game 2 and battle their way back into this series. Cleveland's role players were solid on defense for most of Game 1, but offensively they offered almost nothing. The team shot 27% from three, while Kevin Love and Jeff Green combined to go 2/14. So there's room for Cleveland to make this interesting: execute the same defensive game-plan, trust role players to hit more shots, and count on LeBron to continue being completely out of this world. The Cavs blueprint isn’t easy to execute, but it’s doable. Or ... Golden State could come out and vaporize this team. A blowout could break Cleveland and end the series Sunday. Now, there are reasons to wonder whether the Warriors even care enough to hit that gear. The team has been weirdly sluggish for weeks, they've rarely put together a full four quarters of dominance, and the roster looks shockingly thin in Andre Iguodala's absence. Now Klay Thompson is questionable, himself. But at some point, if they're the most dominant team in a generation, we should probably get a few wins that nobody can argue with. That could be Game 2. LeBron is on the ropes. Oracle will be nuts. There's never been a better opportunity for the Warriors to show the world exactly how unfair they really are.